A respected Loughborough installer with over a quarter century’s experience is benefitting from Stedek’s Residence Excellence. Family-run Wilson Windows has firmly established itself as one of the region’s leading suppliers of quality windows, doors and conservatories. 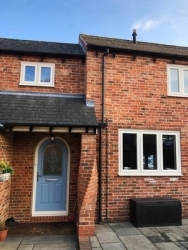 The long-standing firm offers everything from uPVC casements to advanced conservatory roof systems – and when one timber window replacement job called for something extra special, the company knew exactly where to turn. The elegant Residence 7 window is a perfect choice for heritage applications like these, marrying sleek, traditional aesthetics with outstanding modern performance. And few fabricators make R7 with the care and meticulous attention to detail that Stedek do. Callum Wilson of Wilson Windows takes up the story: “When Richard, Stedek’s Sales Director, first visited us to show us the Residence product, he was punctual and extremely helpful. “He was able to answer all the technical questions from our surveyor, and all our questions about window styles and colour options too. “For this project, we ordered ten R7 frames in clotted cream, plus one Residence door. They arrived on the promised delivery date, and Graham, who thoroughly checks over all our deliveries, found no issues with them at all. “Our fitters couldn’t be more complimentary about the manufacturing and finish on the windows, and were very satisfied installing them. Stedek Sales Director Richard Hammond commented: “We’re absolutely delighted that Wilson Windows were so happy with the products we supplied them. For more information visit www.stedek.co.uk or call 01922 724724.